Product Description Dramatic Beauty. Imagine the grandeur and charm of yesteryear's villas, with heirloom furnishings at the forefront, and you begin to get the flavor of the Monticello Pecan Queen bed. 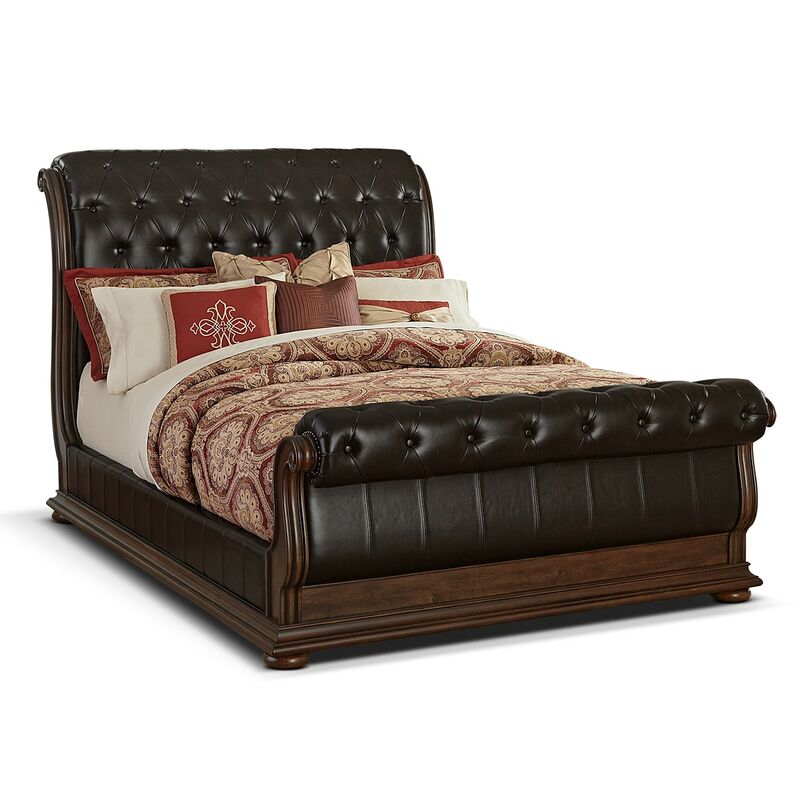 This sleigh bed boasts diamond-patterned button-tufting and lovely rolled details. Prominent bonded leather upholstery exemplifies the old-world styling, and accent stitching and decorative nailhead trim add further visual interest. The pecan finish showcases artfully placed burl veneers that bring undeniable richness to your bedroom. (Mattress set and pillows are not included). Unique Features: Decorative carvings, including scrolled flourishes, exemplify the old world styling. Burl veneers radiate with traditional charm. Enhancing the sleigh bed are a rolled headboard and footboard, featuring rich brown bonded leather and exquisite button tufting. Construction: Hardwood solids beneath the birch veneers ensure strength and stability. Leather Type: 100% bonded leather.